The other day we talked about some new things (and lack there of) that we tried at Disney. 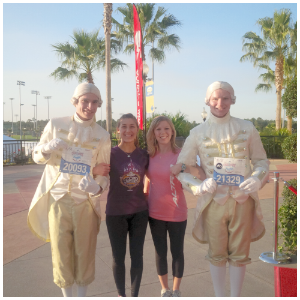 This reminded me of something new that we did see when we visited Disney back in January for Marathon weekend. If you remembered, I wasn't crazy about the marathon necklace that I pre-ordered, so I returned it. My plan was to purchase a necklace at Aribbas Brothers (a jewelry store at Downtown Disney) and have it engraved. I found it odd that they would engrave medals but not necklaces. There goes that idea. While we were at Aribbas Brothers, we saw something else that caught our eye. 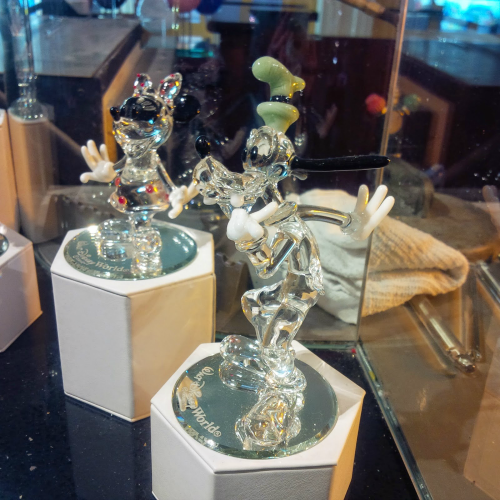 The artist inside the store was making these glass Goofy's. Since we had just completed the Goofy challenge, we were intrigued. This artist was amazing! He started out with just long sticks of glass. He would put them in an oven to make them plyable and then heat them over his torch as he bent them into shape. I'm not sure how he made the color on the hat, ears, and gloves because he had those pieces all made ahead of time and then just connected them to the Goofy as he went along. After putting the pieces together, he then put the finished piece in a cooler. Then it was time to start all over again. We were intrigued and spent a good amount of time watching this artist. Have you ever watched someone "create" something at Disney? They are amazing artisans. We love watching them! Congratulations on the Goofy Challenge!!! Thank you! I should have bought one of those Goofy's to commemorate! We love to stop here and see what they are making - such an amazing art. Thanks for sharing and congrats! We could have watched this guy create all day long! Can you imagine that being your job? How cool! I had one of the artist draw me a Gaston sketch... loved sitting there watching that. He autographed it too like it was from Gaston :) Its hanging on my wall. I know, this guy has one of the best jobs! Although he probably feels like a caged animal at the zoo at times. He sits in his little area working while all the tourist are watching him. That is amazing - I want to get one. I have watched them and it is truly incredible. I would love to have watched him create some other figurines as well. Awww, I hope he got a Goofy Plush character. Those are the cutest! Wow! It has been a long time since I have been to disney but I love the amazing creativity and artisans that they support! Such a cute glass goofy too! No, but I probably should have! 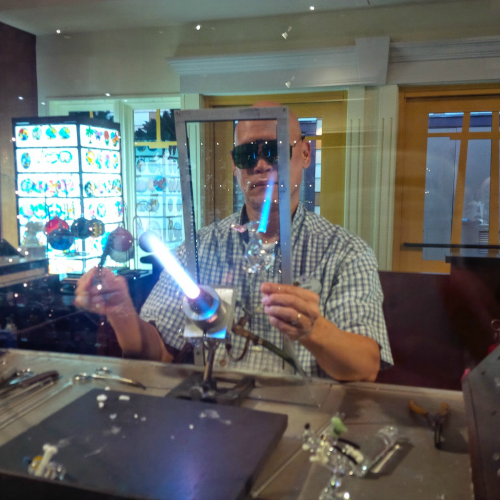 I love watching the glass artists work at Disney! 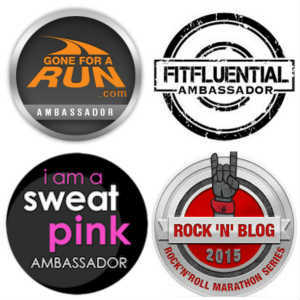 Great idea to get a glass Goofy to commemorate your accomplishment. When I was training for Goofy, I bought a little plush Goofy and kept it on my desk for motivation. Great idea. I had a plush Mickey on mine! Oh those are cute! I've never seen how they were made before either. I love seeing glass workers, it's such an incredible talent and the pieces they create are just gorgeous, I love the idea of a Goofy glass to celebrate your achievement! That is so cool! Glass artists impress & amaze me. I love watching the artists work too! That Goofy is so cute!! How cool! Thanks for sharing the pictures!! Fascinating! Thanks for sharing this master at his craft! 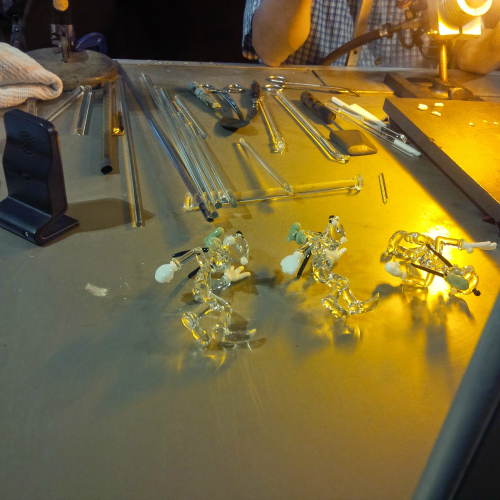 I love watching glass art, and glass blowing! In high school I took a class where we got to melt glass down and form it into things. Now my talents never moved beyond making different shapes of beads, but it really made me appreciate those who can actually do a lot more with it. Just beautiful, love those Disney figures! What a terrific idea! 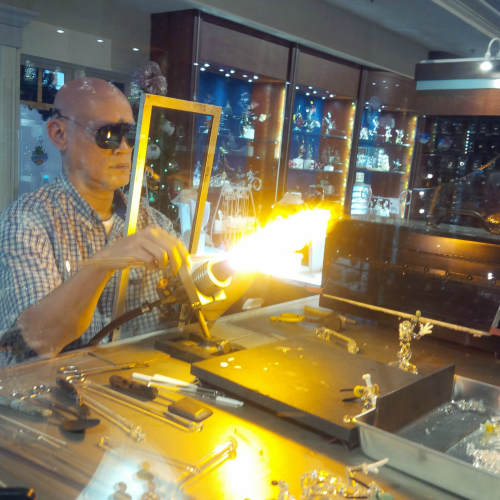 I've seen the glass blowing at Crystal Arts on Main Street, U.S.A, but I've never visited Aribbas Brothers. You earned that Goofy girl! !